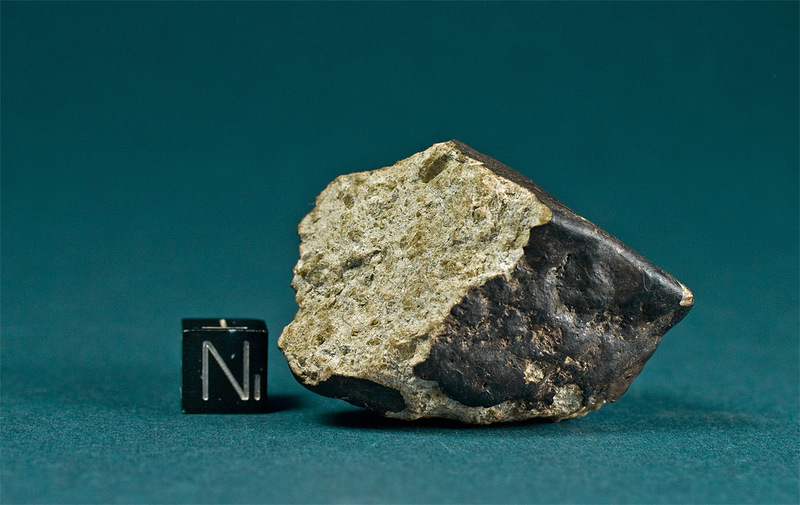 “After a widely witnessed shower, at least 25 kg of meteorites with fresh black fusion crust were collected, comprising many stones. Pieces are reported to have fallen in the villages of Bilanga-Yanga and Gomponsago” (MetBul No. 84). Many masses including the oriented 7.5kg main mass displayed flow lines, some specimens showed dark shock veining. Bilanga is a unique magnesium-rich and calcium-poor diogenitic breccia and one of only 11 witnessed falls of a digenite meteorite. As can be seen in the image above the meteorite shows a fresh shiny black fusion crust coating a bright white matrix with a tint of green. Large orthopyroxene clasts are visible to the unaided eye.